A blood test can be used to check for nicotine. The reasons for this can vary, but nicotine is an indication that a person smokes, which can have a large impact on a person's health. Urine or saliva testing could also be used to test for nicotine. While some tests indicate levels of nicotine present in the bloodstream, other tests indicate either a positive or negative. 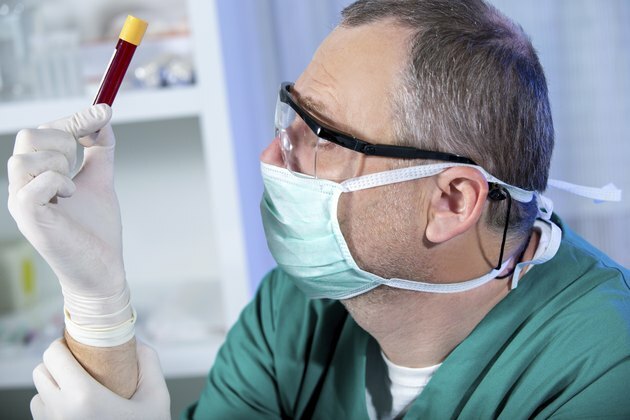 There are several reasons why a blood test for nicotine can yield a false positive. The consumption of some foods before the blood test can elevate levels of substances that can cause false positives for nicotine. These foods include broccoli, cabbage, mustard, garlic, radishes, almonds and horseradish. Vegetarians can have elevated levels of a substance called thiocyanate, which can be a source of a false positive on a blood test for nicotine. People who have particular work environments can have elevated levels of thiocyanate, which can cause a false positive. The work environment is related to working with metal. The related occupations include electroplaters and people who refine precious metals. Nicotine patches, nicotine gum and other nicotine products that are used in smoking cessation programs will yield positives on nicotine blood tests. These are not false positives, because nicotine is actually present in the bloodstream, but unless the testing facility is advised that the nicotine product is being used, there can be a false indication of smoking. As with any human endeavor, there can be errors as a result of human error. Laboratory samples can be mislabeled. Results can be misinterpreted. Good labs have systems in place to minimize these human errors, but they can occur.